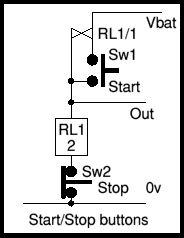 This is a way of implementing a Start and Stop button system suitable for use with 4QD controllers. As drawn it would work with 4QD series, PRO-50, Pro-120 or DNO controllers which have ignition activated by applying a voltage (Out) to the ignition pin. To work with the Porter 5 or Porter 10, a separate set of relay contacts should be used as a floating ignition switch. Momentary closure of the start button will operate the relay whose normally open contacts short out the start button maintaining the ignition. Momentary opening of the Stop button will de-energise the relay.